DePutter's customers make their marketing decisions with confidence. You can, too. Since 1981 we have helped thousands of Canadian farmers and agribusinesses make better, more profitable marketing decisions. They depend on us for reliable commodities market information, analysis and guidance. We've helped thousands of clients. Try any of our services listed below for 21 days. MARKET GUIDANCE SERVICESDo you want our analysis, opinions, and recommendations? Make smart decisions for your farming business. Try us for 21 days. The DePutter Market Advisory Service answers your most pressing marketing questions. What to hold, and what to sell? Which crops have the greatest upside potential, and which have the biggest risk? This comprehensive service gives you the latest market information, plus our big-picture insights and actionable recommendations. So you can sell at opportune times, manage your risk and make the best decisions for your farm. It’s like a full-time marketing professional marketing consultant for your farm. This service gives you our analysis of market-influencing factors, plus strategies and recommendations to make your marketing decisions easier and more profitable. The DePutter team analyzes futures charts, cycles, crop reports, weather, world fundamentals and Canadian markets and the local basis. We give you the straight facts - with strategies and recommendations to make your marketing decisions easier and more profitable. All the latest agricultural news from around the world and Western Canada in a quick, easy-to-read format that brings you up to date on fast-moving issues and market forces affecting your business. The latest futures prices. You know what happened overnight, because each morning’s report lists the latest prices from the overnight electronic trading in the futures markets. All the latest agricultural news from around the world and Ontario & Eastern Canada. A quick, easy-to-read format that brings you up to date on fast-moving issues and market forces affecting your business. The report arrives in your email box every morning by 7:40 a.m. EST to go with your morning coffee. You get the stories that affect your business, distilled them down to the key nuggets that matter to you. The latest futures prices. You know what happened overnight, because each morning’s report lists the latest prices from the overnight electronic trading in the markets. CUSTOM SERVICESMore services to suit your business needs. Speaking, consulting, custom-services and niche market reports are available. I wouldn't want to buy or sell grain without checking Ag-Alert first. Ag-Alert member for 20 years. 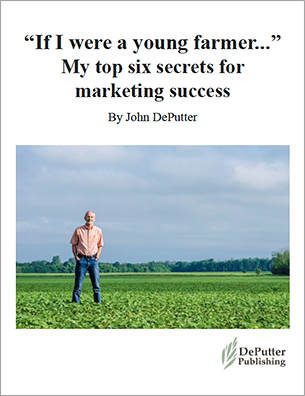 The DePutter service has given me a better understanding of the markets and how to market my crops. With their help I’ve been able to beat the average Ontario price almost every year. Ontario customer for over 30 years. I depend on the DePutter team to help me with my marketing decisions. They’re very conscientious with their work. Ag-Alert member for 18 years. What I really value about Ag-Alert is the level headed approach to marketing. I have to make up my own mind, but I always read what AgAlert has to say first. Ag-Alert member for 5 years. The DePutter newsletter is one of the very few that I look forward to, and read, on a regular basis - I appreciate the DePutter team’s common sense review of the markets. DePutter Market Advisory service member for several years. I can't imagine farming without it. Without DePutter's info I'd be lost. This 4-stage process helps you simplify your life and make well-informed ag business decisions. We gather daily news, statistics and market info from around the world and your province. Want to stop here, receiving this raw material neatly packaged every morning? Get Good Morning Prairies or e-Morning Ontario! We work with statistical data, technical indicators, historic comparisons... and we analyze and filter it all, determining what’s important and what’s not. It’s all put together so you get bottom-line advisories. Wherever you are, you get the reports you want, when you need them, on all your viewing devices. Want to see the end results of the process? See free trials for DePutter Market Advisory Service (West), Ag-Alert (Eastern Canada), Interest Rate Alert.